Tonight I sat next to 95-year-old Pearl Cohen of Florida at a Sheva Brachot following the wedding of her GREAT-GRANDSON! Pearl is, like her name, a total gem. Even though she has outlived her husband and most of her friends, she emanates joy and gratitude. She is also in amazingly good health, physically and mentally–she still lives on her own, hosts Shabbat meals, and volunteers every single week. At the Sheva Brachot she even called over her great-granddaughter to ask if there was anything she could do to help! So I asked her how it’s possible to be in such good shape at 95. The diapers, the tantrums. The laundry, the mess. The difficult days and the more difficult days. Enjoy each day, each day, for what it is– for the pearl hiding inside the abrasive grit and the hard shell of every day of our lives. Words to live by. Was it too long and boring? That sent your spirit soaring? Has a great deal to tell. How is it you feel? -Or like you got a bad deal? Want to have a good life? There are not many ways. Fill up your life with good days. Thank you Bracha (and Chana)these are beautiful words! Love this! Thank you! I will copy and put on my frdge! While I love her advice, and agree with it, and hope to take it to heart for myself, I don’t think this is what gave her the gifts she is enjoying. Pearl has been blessed by G-d. Period. I get puzzled, then troubled, when people start attributing their energetic, healthy old age to a) what they ate, b) how much exercise they did, c) their outlook on life, or d) anything else. It is purely a brachah from Hashem. And now, with people living into their 80s and 90s and beyond, a very precious and rare one indeed. It is a brocha, but we need to make a vessel (kli) to be able to get it. If we are always looking at the negative side of life, then even when we have it, it’s miserable. People have to do their share to stay healthy but even a totally healthy person’s life can end tragically, Chas v’Sholom. Smiling and be grateful for the good things means that we can enjoy each day for the treasure it is. Bracha, how interesting that your poem with Pearl’s exact message in it also has Pearl’s name in the title! 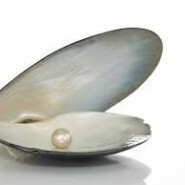 And pearls are unique jewelry in that they are found inside a living creature and formed from the reaction of that being to an irritant. So they are analogous to the trials in our daily lives – full of irritants that, with G-d’s help, we too can transform into what is precious and beautiful.